For individuals who want more! It is still there – the grand freedom to travel places, where big and small adventures attract. You dream of the great sceneries of our globe, of interesting people off the beaten track? Then you need a vehicle that reliably drives you forward even on the roughest roads and supplies you with the required comfort as well. 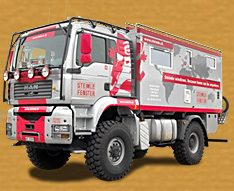 Extreme off-road capabilities, all wheel drive, large ground clearance and robustness of these vehicles are essential.